RoboTask Lite is a freeware and free version scheduler. It is based off of the paid, commercial solution RoboTask. To call it a simple scheduler like Crontab would just be wrong, because RoboTask Lite is able to accomplish much more than running scripts on a schedule. To start off, RoboTask was designed specifically to eliminate repetitive tasks like sending emails, logging in, performing backups and other mundane tasks home users and companies are forced to perform. The usage scenarios in which RoboSoft (Full Version) can come in handy are virtually endless as this program supports a scripting language which can be as simple or as complex as you can imagine; the scripting language included with the full version can contain loops, variable and if/else statements similar to C, PHP or Perl. 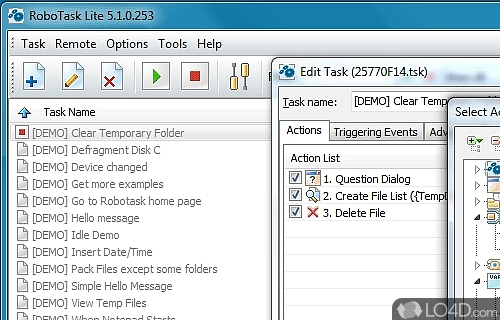 Though the full version obviously offers more in terms of complex automation tools, the freeware version of RoboTask gives you a way to get your feet wet in terms of having a powerful scheduler on your Windows PC; If you want even more, the full version of RoboTask is also available as a free trial. If you want to complete simple-to-medium-complexity tasks on Windows, RoboTask Lite is for you. RoboTask Lite is licensed as freeware for the Windows (32-bit and 64-bit) operating system / platform from automation tools without restrictions. 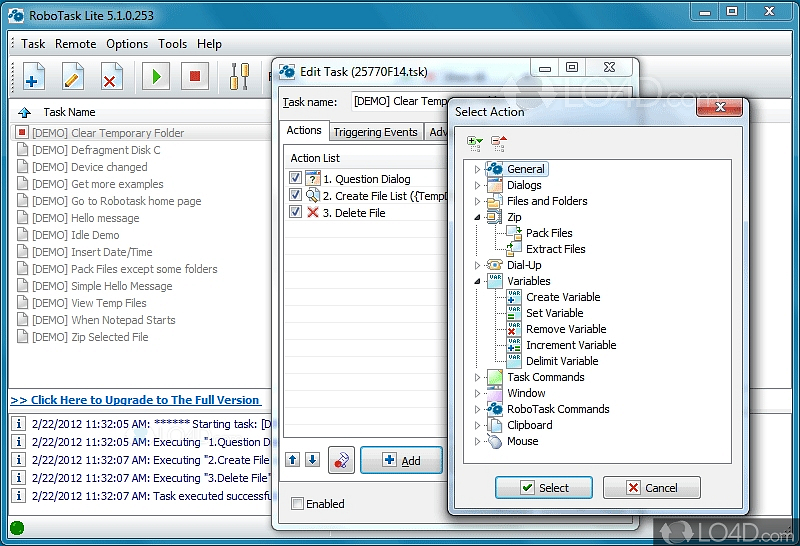 RoboTask Lite 7.0 is available to all software users as a free download (Freeware). Compatibility with this task automation software may vary, but will generally run fine under Microsoft Windows 10, 8, 8.1, 7, Vista and XP on either a 32-bit or 64-bit setup. A separate x64 version may be available from NeoWise Software. This download is distributed as RoboTaskLiteSetup.exe and RoboTaskLiteSetup.zip. We have tested RoboTask Lite 7.0 against malware with several different programs. We certify that this program is clean of viruses, malware and trojans.